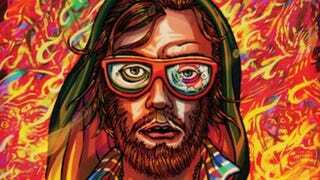 Hotline Miami 2: Wrong Number is no ordinary game. That is, until you assume control of “Beard” in the Soldier Levels during war missions in the jungles of Hawaii. There are a couple of things Hotline Miami is known for: ultraviolence, and players’ questioning their love of it. The answer to the first game’s question, “Do You Like Hurting Other People?” is its sequel, Wrong Number—in other words, it’s a resounding yes. It’s this question that becomes even muddier the second time around. Wrong Number’s not quite the same as its 2012 cohort. It follows some of the formulas that made the first a fever-pitch romp, while ditching others to create something that deviates from the core experience. There are more puzzle pieces to sort out from its foggy storytelling. Dates from varying points of Hotline’s and Wrong Number’s time line are presented out of sequence. And Hotline Miami’s original protagonist is hiding in plain view at a time and in the company of a friend which adds another layer to its already ambiguous narrative. The game also does a lot to create fleshed out personalities of its 12 main characters—some new and others whose fates we believed sealed from the previous installment. It’s a huge roster for a game that moves mostly on adrenaline, where it hardly feels like there’s room to breathe in the ongoing cycle of murder, death, murder and repeat; much less for character development. Some of the characterizations come in five second animations, or two to three lines. With the exception of a couple of characters, they feel an integral part to the disjointed narrative, despite how little time we are given to get to know them. Some of Wrong Number’s changes—such as the expanse of the levels leading to extra careful planning in disposing enemies—feel like missteps; other changes like accomplishments. Regardless, all these risky moves allow Wrong Number to take what was presented in the first game and destroy everything we thought we figured out: its characters, gameplay, and its messages. It’s this fractured view and the nagging question I already thought I answered “yes” to, tied together with its ongoing subversive storytelling that reaffirms my admission of guilt—I am a terrible person. I do enjoy hurting other people in Hotline’s world. But not quite in the way the game expects of me. I’m about to admit something that I’d rather not: I didn’t enjoy fighting for a just cause in Wrong Number’s war. The war in Hotline’s universe is one between America and Russia. I’m not horrible for a lack of perceived patriotism especially when the game blurs distinctions as to right or wrong, good or evil or even the identity of the true instigator who bears responsibility for the strained relations between the two countries. I’m horrible because those levels dedicated to the war in Hawaii did not feel exhilarating. There was murder a plenty but it was murder with a purpose stemming from duty as a soldier in war. Of greater significance is the necessity of their inclusion to Hotline’s overall narrative. The levels tell an important back story for one of its characters while possibly explaining a key character’s perception of events which give the first game its distinct visuals and feelings of witnessing a bloody psychosis. But the Hawaiian levels make those portions of Wrong Number feel more like a regular game, and a lot less like an unsettling experience. Interestingly, Hawaii’s jungles feel like gritty realism. It’s a far cry from Hotline’s regular aesthetic of a trippy, colourful and seedy nature. The latter is the realism that the game ingrained into our senses for the majority of its composition. The Hawaii levels in Wrong Number are so sharply contrasted to Hotline and the bulk of its own game that its grounded realism feel uninspired—which, unsurprisingly, is sort of the point. Consider the copycat killers of Wrong Number’s The Fans. The Fans copy the penchant for murder and much of the style of the first game. The vigilante, deranged group of five feel intentionally closer to and mimic the actions of Hotline Miami in mindless, stylish killing and unmitigated fun gameplay while the levels themselves deliver the warped aesthetics unique to Hotline. They are a tribute to the original protagonist in how they adopt his ruthlessness with their motivations questionable. They’re also a shout out to players who may be adverse to the changes Wrong Number bring. Their brief appearances are reminders of what the first game offered: choices in masks, and quick-thinking daring movements set to a song by Carpenter Brut “Roller Mobster” that is reminiscent of some of the heart pounding, techno beats of Hotline’s signature soundtrack. Now consider the Hawaiian levels. Primarily devoid of the abundance of the sickening pinks and purples which define the rest of the game, they are drab in comparison. They give a different sort of tension—a night time mission set under a dreary-toned steady rainfall, a daytime invasion of the enemies’ compound, and a visibly hazy raid of a power plant...Real stakes to the setting of a real war, not one set in the typical strange version of Hotline’s reality. They exude less of an 80’s campiness to Hotline’s Miami, and it makes those gameplay sections of the game feel like bland storytelling as a result. Adding to this boredom of playing a run-of-the-mill top-down action game (granted with more spilled pixelated guts than most), is the spike in difficulty. Wrong Number is not an easy game as a general rule. The Hawaii levels in Wrong Number give the players’ “Rambo”-esque abilities, equipping them with no more than a knife and one firearm of their choosing (as the game progresses, five weapons are unlocked in total). It’s possible to run out of ammo and replenishing the ammo—a first for Hotline Miami, whose gameplay is usually characterized by no shortage of weapons at your disposable—is easier said than done. The mixed playstyle is demanding but can ultimately feel like achievements, particularly when the game forces players to change up how they approach levels with every new character in a short span of time. It’s a series of ups and down—becoming comfortable in one particular method only to throw you for a loop with the next— tasking players with re-learning styles. There’s nothing wrong with the gameplay as it presents an added challenge and is a smart change. What doesn’t feel great about the Hawaii levels though, is being bound to a set of rules in huge open areas, specifically the final level in Hawaii. The levels are a blend of stealth and survival—just the kind of thing you’d expect when launching covert attacks on an enemy’s territory in a jungle of another country. With the increased size of these levels, it disrupts the flow of Hotline’s rhythmic, cyclical gameplay. Stealth is something I am rarely good at and exactly the sort of gameplay I despise most, so Hotline’s usual style to go guns-a blazing or like a knife wielding maniac in any given situation is a perfect, guilt free slash fest for me. No matter how many times the first game served a heaping helping of death, the tight spaces and small levels encouraged repetitive play. They nurtured a driving desire to complete the level in one go because victory always felt just within reach. There are points to Wrong Number’s later levels that stunt the swift action that largely make up the first game. The large levels don’t often feel as rewarding, and are at times downright frustrating. Every wrong move could set players back minutes upon minutes of this rinse and repeat, which is especially annoying given the levels require lots of memorization, plotting and luring enemies just to reach the end. A few feel as noticeable as the final mission in Hawaii but along with the dull colours in the presentations and its justifiable murders, those Hawaiian levels are the ones that stick out like sore thumbs. When the game took the familiarity in aesthetics and gameplay away, I couldn’t help but think of Wrong Number in those moments as mundane. I felt awful as I trudged through the final Hawaiian level. It’s one the game describes as a pointless final order from the government and one that is implied would amount to nothing more than a suicide mission for Beard and his band of brothers. I felt awful with this knowledge as the heroic, emotional piece “The Way Home” by Magic Sword played to accompany a would-be death wish. I felt awful as its notes hit a somber chord that have a small iota of hope sprinkled in, but mostly express a really tragic ending. The Final Act for Hawaii exists to serve a larger touching story featuring one of the best characters without the questionable cloud hanging over his head on whether he was morally depraved. Hotline’s brilliant story was one that I emotionally connected with when all was said and done. But what I felt most awful about during my time with the game was that I couldn’t wait to get out of the Hawaiian levels as quickly as possible because my fun was removed. My fun of the guiltless, ruthless, bloody murder sprees I’d become so accustomed to in Hotline Miami. How terrible does that make me seem? I can tell you it makes me feel amused, and slightly disturbed. It’s just one more arcade point scored for Hotline Miami’s expectations—breaking mine apart to show me just another way that I’m merely one more member of The Fans the game mockingly created. Follow N. Ho Sang here or on Twitter at @Zarnyx if you’re feeling a like going on a guilt trip, or you can read her articles here.